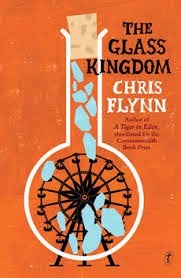 Simply put, The Glass Kingdom is a novel about the ins and outs of meth dealing, set on a travelling carnival. It is narrated in turn by Corporal Ben Wallace, who returns to his carnie roots after being injured in Uruzgan province in a roadside bombing attack, and Mikey 'Mekong Delta', a wannabe rapper from Fremantle picked up by Ben as the show passed through. But to be less blunt, The Glass Kingdom is an exciting novel which tests your allegiances with literary skill. It allows the reader (whatever their level of experience with this criminal underworld) to enter a very specific slice of the world and look out from the inside. The first half of the novel is narrated by Ben. It moves quickly. Ben has meth, and is trying to make a killing selling it. He seems like a nice guy, a little damaged by what he's seen and extremely sensitive about the wounds to his neck, caused by burns sustained in the attack. People are afraid of him. He's resigned to this but not pleased by it. He reluctantly takes Mikey in because he sees something fragile in him. Mikey seems annoying as all hell, talking like a television gangsta (Fifty Cent perhaps), and constantly busting rhymes out, although these are pretty clever. Then Mikey takes off. He takes Ben's girlfriend's car, which actually seems like a favour to Ben because it brings Ben and Steph closer together. Steph loves Ben despite the scarring, and they seem together. She doesn't mind what he does for a living, and goes along for the ride when Ben decides to follow Mikey down the Glass Highway to get back what was stolen from him. The section ends on a cliff hanger that left this reader actually missing Ben's voice. The second half is told from Mikey's point of view, in a kind of dialect monologue. Mikey's section is less direct, told almost passively, in a way that would make a great monologue if it were to be performed on stage. This section is not as compelling, as the reader does not get to be in the moment, and at times it is hard to tell what is real and what Mikey is hallucinating, such as his conversation with the girl Deb in the bar. What's great about this part of the book is that everything we already thought we knew about the characters is tipped onto its head. Ben is a scary meth dealer who's not averse to killing people. Mikey is young and innocent and vulnerable... okay so maybe not as innocent as he thinks he is... and is not all there in the head thanks to childhood trauma and abusive step parents. He's got big dreams that he doesn't know how to go about realising. In this section, Mikey is good and Ben is the bad guy. So who do we believe? There is a section in the middle of the book which is narrated by Voltan, the Master of Electricity which explain's Ben's past, most likely because the author has decided Ben is the kind of character who wouldn't give this up on his own. It's confusing, and it detracts a little from the flow of the book. I don't even know if the information in it is strictly necessary, but it does give the story balance, as Mikey is given a chance to tell about his roots. Some of the imagery set in this section is repeated in the coda of the book which seems almost like a dream sequence, a fading consciousness hallucination. I actually don't think either of these sections were needed. My other gripe was the lack of clarity and immediacy in the climax of the book. Because the action sequences in Mikey's section were told in this indirect, hip hop style, they lost some of their punch. If they'd been told in Ben's voice, I got the feeling they would have been told just right. I don't think that true balance was achieved between the two narrative sections. However, I really enjoyed this book and I did not even expect that I would. This is a book for anyone, young, old, interested in meth dealing or totally against it (like me, in case you're wondering). It's funny, it's got great Australian social commentary in it, and it's quick without being insubstantial. I'm definitely going to find Flynn's first book, A Tiger in Eden now, because Flynn's got skills. A terrific assessment of a terrific novel. I liked the third section more than you but I'm very glad that you intend to read A Tiger In Eden - I think you'll enjoy that as well, although I'll be surprised if you like it as much as you liked you'll find it The Glass Kingdom.